A week ago when the weather was warm and nice and I thought the winter is gone for good I noticed in my garden some snowdrops (ghiocei) preparing to blossom and, as cliché as it is, I wanted to take a photo, as the message is strong, they are the first flowers of the year, the triumph of live over death, spring over winter. With a full time work, at 7:30 in the morning when I leave home is not enough light and at 19-19:30 in the evening when I get back, it it already pitch black for a couple of hours already… yeah, that’s one of the ugliest parts of the winter, so my only chance was to wait for the week-end, hoping also for a ray of light, to make the photos more lively. Much to my surprise, today (Monday) morning when I opened the door was hit with a huge surprise: everything was white, a full winter is back. 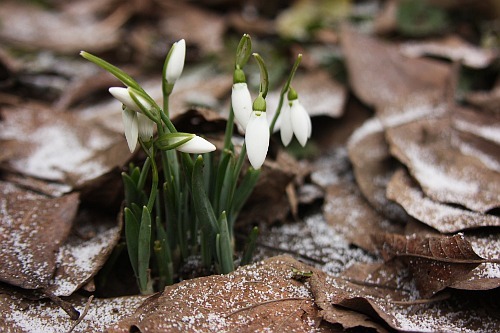 Of course my snowdrop flowers were covered fully in snow and of course it was too early in the morning, to dark to take a contrasting photos about how winter has won one more battle.